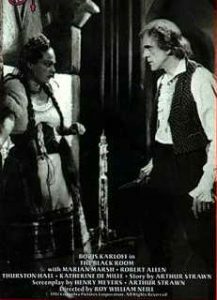 Boris Karloff is superb in a dual role as twin brothers (one evil, one good), born to the ruling family in the early 1800’s in Czechoslovakia. The bad twin inherits the castle and becomes infamous for his sadistic behavior and murders the good twin, assuming his identity so that he might continue his heinous acts. The Black Room is a surprisingly good Boris Karloff film, with Karloff demonstrating his acting skills playing the part of twin brothers, Gregor and Anton. Born into a small European country in the 1880’s, their father, Baron Frederick de Berghman fears that the brothers will fulfill an old family prophecy, with the older brother being murdered by the younger, in the “black room” of the castle, as happened to their ancestors. As time goes on, it seems that the prophecy is unlikely to be fulfilled, as the older brother, the new Baron upon their father’s death, is mean-spirited and cruel, while the younger leaves–to learn, and to put room between himself and his twin, and the fear of murder. 10 years later, however, the “good” twin is summoned home by his older brother, who is about to be overthrown by his subjects–and announces that he’s abdicating in favor of his brother. This is a ruse; instead, the evil Gregor kills the kindly Anton, throwing his corpse into a pit concealed in the “Black Room”–but Anton affirms, with his dying breath, that the prophecy will be fulfilled, even if he has to come back from the dead. However, this isn’t a ghost story, and the evil Gregor takes the place of the good Anton, even imitating the younger brother’s paralyzed arm, and is beloved by the people for his ‘kind’ ways. Gregor hasn’t changed his ways, however, and kills their family friend, Colonel Hassel, in order to marry the Colonel’s daughter … and blames the murder on his romantic rival. In the end, the ancient prophecy is fulfilled, in a twist of fate–but I’ll leave it to you to watch the movie for yourself rather than spoil the ending. My daughter and I both enjoyed The Black Room, and we both recommend it. I rate it 3 stars out of 5. 1935’s The Black Room, is a wonderfully lurid costume romp with Karloff in a dual role: twin brothers who inherit a baronage but live under a family curse. One is good, one bad, and happily enough, the bad brother has the upper hand. Karloff is in terrific form, and the film features a secret chamber (complete with torture pit) that provides just the right Gothic oomph. Director Roy William Neill later did Frankenstein Meets the Wolf Man. Baron de Berghman: This house began with murder. It will end the same way. Baron de Berghman: “Principio Et Finem Similia.” I end as I began! Mashka: Don’t you want to kiss me? Baron Gregor de Bergmann (Boris Karloff): [Cutting a juicy pear with his knife and eating it as he talks] A pear is the best fruit! Mashka: Every time you see her, you want to be rid of me. Baron Gregor de Bergmann (Boris Karloff): [Seemingly ignoring her] Lots of juice in a pear! Mashka: Well, you’ll find out I’ll not be got rid of so easily! Do you hear what I say? Baron Gregor de Bergmann (Boris Karloff): Adam should’ve chosen a pear. Mashka: You’ve got it all planned, haven’t you? You’re gonna marry her. You’re gonna make her your wife, your baroness! Baron Gregor de Bergmann (Boris Karloff): [as Anton lies dying in the well of the Black Room] Goodbye, brother. There’s nothing to fear now. The prophecy can’t be fulfilled. Anton de Bergmann: [With certitude] It will be fulfilled! Baron Gregor de Bergmann (Boris Karloff): Perhaps you will come back from the dead to kill me? Anton de Bergmann: [Dying words] Even from the dead! Col. Paul Hassel: [Playing chess] Your attack is weak as your brother Gregor’s was brilliant. Chess, by the way, was the only virtue I ever discovered in him. Baron Gregor de Bergmann (Boris Karloff): I received a letter today from him from Warsaw. Most of it was devoted to begging me to send his love to you, Colonel. Col. Paul Hassel: His love to me? Well, if I have to accept it, I’d rather have it by post than any way I can think of.